Andy and Ariana’s performances are “quirky, exotic and enjoyable,” rather like CBC’s Stan Carew’s description of their CD Eye to Eye (2013). An original mix of gypsy, roots, jazz and blues combine Andy’s guitar/bass and beat-box rhythm section with Ariana’s vocals, violin and saxophone. A soulful joyful sound. The duo have been playing music together for about 16 years and have at least 8 CDs to their credit. Their wide ranging musical and song writing inspiration draws from their Swiss/Danish and Afghan/Canadian roots, to popular music ranging from jazz to rock to the inherent love for music that is a Nova Scotia tradition. East meets West meets Nova Scotia kitchen party! 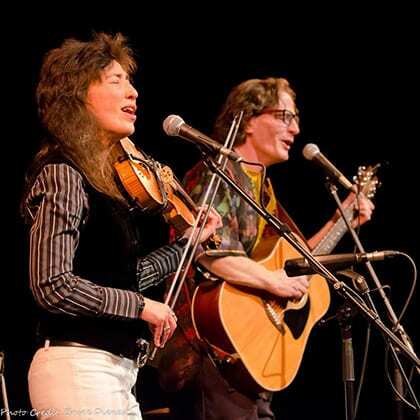 In a new project for Deep Roots this year, Andy Flinn and Ariana Nasr have been part of an artist exchange with The Montreal Folk Festival on the Canal, and in return, Sin and Swoon, a Montreal country duo, will perform at Deep Roots. Andy and Ariana’s latest project includes the release of Ariana’s La Vie en Rose CD just this past April. The album (produced by Andy) features the music of the much-loved French singer, Edith Piaf. They have been busy travelling and performing the show they have created around this evocative French music at venues around the country. They will bring their show to Deep Roots Music Festival main stage on Friday night; “Ariana Nasr Chante Piaf” and you can expect to be impressed, especially if you are at all familiar with Piaf’s work. We’re delighted that they aren’t too busy to spend some time at home and on our stage at this year’s Deep Roots Music Festival.